Frome Town Council has now submitted a planning application to enable the next phase of Market Place improvements. This phase will address the problem of congestion caused by the current positioning of the bus laybys and will make the Market Place more attractive and pedestrian friendly. The main elements include: realignment of the bus laybys so that buses can park off the road; new bus shelters to improve the experience for bus users; enhancement of the existing informal crossing points by installing wider pavements and coloured road surfacing where pedestrians regularly cross now (between the Coventry Building Society and Boyle Cross and The George Hotel and Boyle Cross); improving the pavements; a new loading bay outside The George Hotel to support town centre businesses; improvements to the facilities for disabled drivers in Cork Street and a new disabled parking space in the Market Place outside Fat Radish. The plans follow consultation over a number of years culminating in a public exhibition in November 2018 which was well attended. Since then, there have been in-depth discussions with several interest groups including Frome Chamber of Commerce, Frome Civic Society, town centre businesses, the disabled (represented by PACE), the police and the bus companies. The comments received have been considered carefully and the scheme amended to take account of them. Frome Town Council has also worked extensively with Somerset County Council Highways Team to ensure that the scheme is both safe and workable. 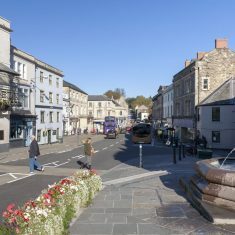 Peter Wheelhouse Economic Development & Regeneration Manager & Deputy Town Clerk at Frome Town Council said: “In preparing these plans we have taken care to work closely with interested parties and after much consultation we are confident that this scheme will improve both the look and functionality of the Market Place. We are now at the final preparatory stage of this project and look forward to securing planning consent so that we can move quickly to implement these important improvements to the town centre. The plans can be viewed at Frome Town Hall at Christchurch Street West. The office is open from 09:00 – 17:00 Monday to Thursday. On Fridays, the office closes at 4.30 p.m. The plans can also be seen on the Mendip Planning Portal where you can also comment here. Frome Town Council is preparing to invite tenders and further details will be published shortly. Go to FAQs for further information on this scheme here. Alternatively, contact Peter Wheelhouse, Deputy Town Clerk or Jane Llewellyn, Planning & Development Manager at info@frometowncouncil.gov.uk or on 01373 465757. A Clean future for Frome? Copyright © 2019 Frome Town Council. All Rights Reserved. Web Design.